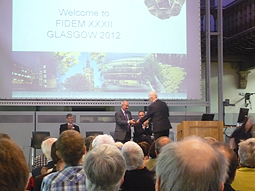 The XXXII FIDEM congress took place at the University of Glasgow. It was organised by the Hunter Coin Cabinet of the Hunterian museum with the collaboration of FIDEM. The University of Bergen was a generous sponsor to this congress. The organising committee was composed by Philip Attwood, Ron Dutton, Sally-Anne Coupar, Donal Bateson and Ilkka Voionmaa. 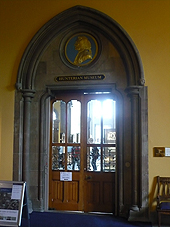 The Hunterian is the oldest public museum in Scotland. The building with its Gothic style was designed by Sir George Gilbert Scott and was inaugurated in 1870. 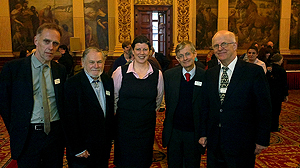 The opening ceremony took place in the Kelvin Gallery of the Hunterian. The weather was a major topic of the opening speeches. It started with the welcoming words from its director, Professor David Gaimster, who gave a short history of the university. The congress was then formally openend by Sir Kenneth Calman, Chancellor of the university, who promised that once the sun would come out, a medal would be struck in its honour. 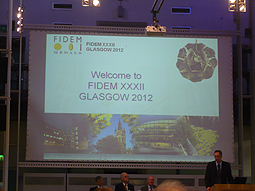 The President of FIDEM, Mr Ilkka Voionmaa thanked Glasgow University for hosting the congress. 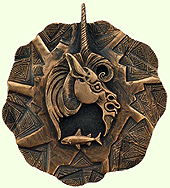 He said that Glasgow was now to be considered the capital of medallic art. He also mentionned that during this congress, FIDEM is celebrating its 75th anniversary. He ended by saying that the participants should enjoy the weather since after all it was just a summer drizzle... while outside the windows, the rain was pouring down. He then presented the FIDEM at 70 medal to the chancellor.